This version of the traditional kiss cookies were inspired on a recent trip. I was with my husband visiting his family. His aunt had a bunch of chocolate bars and asked what she could do with them. I of course thought of chocolate and peanut butter and suggested the kiss cookie recipe. After she baked them I of course ate quite a few. My mother sent me a huge package of candy for the holidays and a bag of Hershey's Miniatures was in it. I decided to put them to good use.. In a large mixing bowl, beat shortening and peanut butter until well blended. Add 1/3 cup of granulated sugar and 1/3 cup of packed light brown sugar. Beat until light and fluffy. In another bowl stir together flour, baking soda, and salt. Gradually add peanut butter mixture. Shape the dough into one inch balls. While cookies are baking remove wrappers from candy. 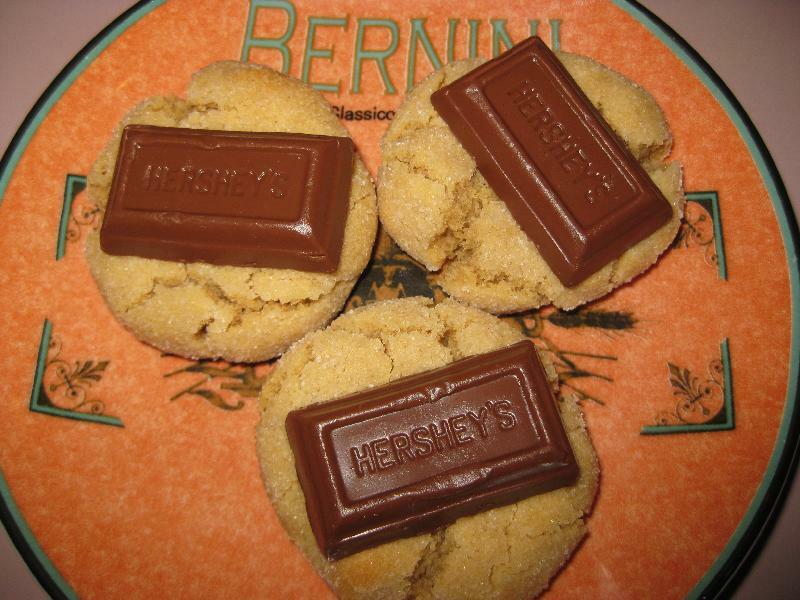 Immediately place chocolate bars on top of each cookie after baking and press down slightly. Remove cookies from baking sheet to wire rack. Cool completely. Description: Peanut butter cookies with chocolate on top!